Did you know that Radio One rents push-to-talk (PTT) walkie talkie phones from AT&T and Verizon. Many of our customers rented Nextel PTT devices back in the day. Nextel has gone away but you can still rent a similar device on the AT&T and Verizon networks. Some of our customers don't want to carry a bulky two-way radio when working at an event or trade show. A lightweight rugged phone is a perfect solution for your "on the go" employees. The Kyocera DuraXE is easy to use, and with rugged waterproof and Military Standard 810G protection. The DuraXE delivers high-engagement features to support your work teams in almost any harsh environment. With its Enhanced Push-to-Talk (EPTT) focused design, large dedicated side button, loud and clear audio, and integrated 5-megapixel camera and camcorder, DuraXE helps you stay connected and productive in tough working conditions—without the expense of a data plan. The DuraXE features a rugged design. It takes care of business even in tough work environments. DuraXE offers reinforced housing, dust and waterproof IP68 certification (30 minutes, 6 feet), and Military Standard 810G protection against dust, shock, vibration, temperature extremes, blowing rain, low pressure, solar radiation, salt fog, humidity, and water. It has extra loud speakers. Hear clearly, even in noisy environments. DuraXE is equipped with dual front speakers, a dedicated speaker key, and microphone noise suppression. The rugged 4G LTE DuraXV+ by Kyocera is waterproof and meets military standards for shock and dust protection. Its simple to use, with an external high-contrast display for viewing outside and buttons that can be pushed while wearing gloves. Dual front-facing speakers offer clear sound. 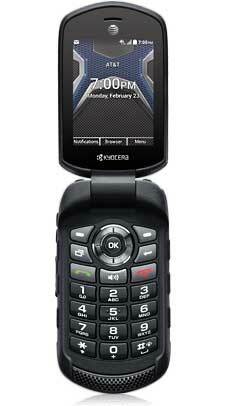 The Kyocera DuraXV+ is made for adventures and life’s mishaps. This rugged flip phone has a long–lasting battery and meets military specifications for shock, temperature extremes, dust, vibration, blowing rain and more. It can even be submerged in up to six feet of water for up to 30 minutes. Please contact us today for more information on our Cellular PTT Rental Program.